In just one week you can feel more confident, rock relationships, heal heartbreak, be empowered and clarify your boundaries! 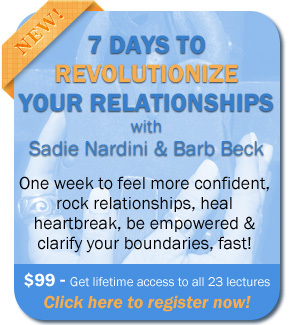 Join me and my colleague, friend, and client Sadie Nardini as we reveal 7 powerful Steps to Revolutionize Your Relationships which can set you free from cycles of drama and despair, get you crystal clear about what you want and how to get it, and help you bust roadblocks to your greatness. What are you going to get from this amazing 7 day course? Over 23 lectures and 3.5 hours of content! 7 CORE CONVERSATIONS: sessions with Sadie and Barb, discussing 7 crucial steps you must take to have a powerful new relationship with yourself and others. 7 REVOLUTIONARY LOVE 'DEEPEN THE WORK' missions from Barb on how to deepen the inspirations and ideas you've gotten into real transformation. 7 REVOLUTIONARY LOVE POWER YOGA MEDITATIONS WITH MUDRAS: Sadie leads you through a meditation, with hand mudras to charge them up, that you'll use in your toolbox for a lifetime to get grounded, set boundaries, bust heartache, clear out heavy emotions, and so much more.